WHO ARE AMERICAS TOILET TEXTERS? With generation Z growing up in the internet age and 66.7% of the world’s population having smartphones, we now have the largest demographic of digitally connected phone addicts. Smartphone manufacturers have been criticized for the addictive nature of their devices, everywhere you look someone is texting, tweeting or talking on a mobile – what about where you can’t see? Are you guilty of using your phone to the toilet? BankMyCell’s survey set out to unearth the present state of smartphone usage in the toilet combined with confessions of the extent we go to stay connected. Further to other previous studies, we set out to uncover data that would highlight the bathroom cell phone use trends between gender, generation, and even the device operating system. What does the toilet texter usage look like between generations? Does the smartphone operating system impact bathroom usage? What are the smartphone functions that occupy the most toilet time? What eccentric bathroom phone behavior comes with these usage trends? HOW OFTEN ARE PHONES USED IN THE TOILET? BankMyCell began the survey by looking at the consistency of our subjects toilet texting behaviors. Our previous study on cell phone addiction illustrated the rise of dependence and the triggers of separation anxiety people get when absent from their smartphone. This new survey data suggests that that smartphone use in the bathroom is much more predominant in men, with a greater number of female respondents using it rarely to never. 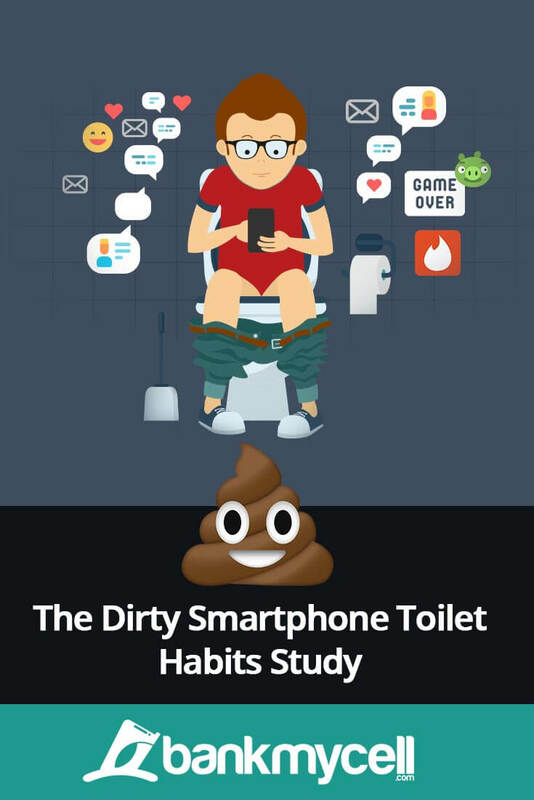 Additionally, previous surveys since 2011 show the average figure anywhere from 38 to 75 percent, so it’s interesting seeing that this average is swayed by 80% of males admitting to using their phone on the toilet. Surprisingly, 88% of Android users in the operating system specific survey topped iOS, making them 12% more likely to pick up their phone in the bathroom. The study shows generation Z (96%) and Y (90%) have overwhelming toilet texting interactions, showing just how disturbingly dependent Gen Z and millennials are on smartphone interaction. It’s shown in previous studies that these generations have the highest global demographic smartphone ownership and addiction. This generation Z data is particularly concerning, our cell phone addiction report showed smartphone dependence to increase anxiety, stress, narcissism, depression, concentration issues and more. Additionally, we were shocked to see 11% of the silent generation taking cell phones to the toilet too, the correlating low app usage data suggests this may be more of a convenience for mobility/sense of security among other possibilities. Generation Note: With so many overlapping generation-defining birth dates we standardized logical breaks correlating to popular suggestions from Wikipedia sources. These can be seen in the chart above. During the specified timeframe of the survey, these were the U.S. states where cell phone usage in the restroom was the most popular. You can hover over each state on the interactive map to reveal the popularity scores or see the raw data in the table below. WHAT SMARTPHONE FUNCTIONS DO YOU USE ON THE TOILET? This survey data highlights the most popular uses of the smartphone during ‘toilet time’ by gender. Social media tops the list with over half of respondents confirming so in their top selections. Other noteworthy ways to ‘pass the time’ are messaging, setting the mood with media and that males loved turning the lavatory into a private games arcade. The most distressing find was one in nine males using dating apps, so in theory one of your matches on Tinder could have been from someone sat on ‘the throne’ …who says romance is dead! WHO USES AN APP IN THE TOILET? According to a study by LivePerson, 73.7 percent of Generation Z and Millennials rely heavily on interactions via phones and apps in comparison to real life. Messaging has also vastly surpassed calling so it’s no surprise they are the heaviest app users in the bathroom. This survey shows the demographic and gender split between them is dominated by Americans under the age of 23 (Generation Z). HAVE YOU EVER GOT YOUR HIGH-SCORE ON A GAME ON THE TOILET? Is your roommate or spouse taking longer in the bathroom these days? Is that one guy at work in the bathroom for way too long every time? Well not only do 35 percent of men confess to using the toilet as a private games arcade, one in five American males have achieved their top score there! HAVE YOU EVER SENT A SMARTPHONE PICTURE FROM THE TOILET? Sending pictures from the toilet could be interpreted in a variety of ways. Anything from mirror selfies, sending snaps to friends while getting ready for a night out and undoubtedly naughty snaps. Being optimists at BankMyCell we hope that snaps of actual toilet contents, but we have to face the likelihood it’s happened. This survey reveals 37 percent of women have taken a bathroom selfie compared to the mediocre 9 percent of men, with an average of one in five people sending toilet snaps. HAVE YOU EVER ANSWERED A PHONE CALL FROM YOUR BOSS WHILE ON THE TOILET? Many take a timeout from work in the one place of security (the bathroom) where people text, browse social media and even play games. However, if you’re on paid work time and your boss calls, what do you do? Well, one in nine men confessed to taking a call from their boss while on the toilet rather than waiting to call back after. HAVE YOU EVER DROPPED YOUR PHONE DOWN THE TOILET? The first shocking find is that nearly one in five women have taken their phone for a dip in the toilet. Really consider that for a moment, in comparison to men that have surveyed one in eight which is still astonishing. It’s worth noting most smartphone devices have water damage detectors which can void any manufacturer’s warranty or trade-in examination. According to a survey by insurance firm Protect My Bubble, the bathroom is the second most common place to damage your smartphone. Almost 1 in 6 Americans have dropped their phone down the privy! WHAT'S YOUR PHONE HYGIENE COMPARED TO YOUR HANDS? This nauseating survey result shows that 90% of Americans clean their hands but only 16.5% clean their phones. Which is shocking when 74.5% of the population take the phone to the bathroom. Scientists at the University of Arizona have found that cell phones carry 10 times more bacteria than most toilet seats. So maybe after you’ve spent 20 minutes on the toilet playing Fortnite, a quick wet wipe of your cell phone wouldn’t be such a bad idea. A series of surveys were conducted by BankMyCell between 06/01/2018 to 08/31/2018. BankMyCell’s surveys registered respondents gender, generation and operating platform then asked a series of questions. The core data from 2,114 people in the U.S was extracted and used in this report. The survey tool collected additional information that came in useful in verifying the demographic side of the study. Information such as IP address, country, and state let us filter entries and isolate it to the U.S.